Every Thanksgiving, the rest of America puts a turkey in the oven and sprinkles marshmallows over sweet potatoes. They sleep in late, watch football. Or so I would imagine. Our house begins to stir at four in the morning, before dawn has even considered breaking, before other, normal families pile into cars and head down the Turnpike. We grumble and coax ourselves into stiff formal clothing, struggling to fasten buttons with fingers that the November cold has rendered useless. The turkey is neglected, and football ignored in favor of a far greater sport: foxhunting. Most people are horrified when I tell them I go foxhunting, because of the misconception that its aim is to kill a fox. I reassure them that is extremely unusual for us to actually catch the fox, and even more rare that it is killed. Instead, the sport’s thrill is in the chase. 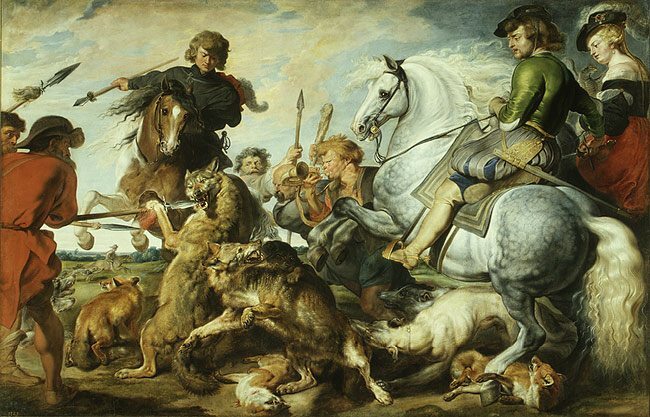 The hunt itself is a primal game of tag: a group of horseback riders follow the red coat of the Master of the Hounds, who follows a group of English foxhounds, who follow a fox. What is made as far from simple as possible is the pomp surrounding this glorified game. The hunt leaves promptly at six-thirty from a neighbor’s back pasture, or perhaps the courtyard of a palatial stable. As with all traditions of the aspiring aristocrats, there is a firm dress code: black wool jacket, beige breeches (white, if one wears a frock coat), and black boots. The horses are similarly immaculate, grooms having spent hours braiding their manes into tiny florets. This tidiness is fleeting, as both man and steed are covered in mud in the first five minutes of a gallop. My family is regarded as barbaric because we groom our own horses, and I grew up mucking stalls instead of outsourcing the task to a stablehand. Many riders arrive separately from their grooms, who deliver horses fully prepared, as though they were catered meals instead of steed. In this town, it is not unusual to have a live-in staff, specifically for the horses. This opulence is particularly outrageous at the Thanksgiving Hunt. The formal hunting season runs from fall to early spring, so Thanksgiving marks its debut. Two hundred people gather, on horseback, in the front pasture of an estate. This is the way outrageous, inherited wealth displays itself. Rather than announcing itself in gaudy mansions and cars, it hides, old and integral, within these hills. Foxhunting is one of the only ways to truly see where such people live, to get behind the security gates—on the back of a horse. People who have grown up with wealth have no reason to show it off. Foxhunting, like philanthropy, is the perfect venue for this kind of money: it is an activity that requires knowledge of a certain culture, rather than just capital. Everyone in the field grew up hunting with their parents, and practicing the etiquette of the field. They learned to stay behind the Master and between the red-coated Whips; to call “where-hole!” and point when they spot a gopher’s burrow; they were taught to knot stock ties before they knew how to tie their own shoes. Anyone with money can buy a Lamborghini; it takes years of tutelage to learn how to ride a $200,000 horse over cross-country fences without endangering your life. While foxes are not killed, people and horses do get hurt. The fancy trappings disguise the fact that the hunt is simply a mob of horses galloping across fields, through woods, into narrow paths. Horses and riders bump flanks, cut each other off, get kicked. Britches are torn by brambles, faces made muddy with soil and blood, relationships severed by poor manners in the field. Amid this chaos, I’ve only seen one animal die. He was much larger than a fox. One particularly grueling hunt had us descend into a hollow in the woods. At the bottom, we heard a commotion. A grey gelding I had noticed earlier, because of his dapples—a beautiful spotting pattern on his coat, like a leopard—had fallen into the creek. The hunt, which has been known to callously gallop away from men clutching broken limbs, stopped. We watched, in the winter silence, as the rider urged the grey to rise. Water pooled around him as he lay in the brook, sides heaving. His rider sat in the stream with him, leather boots swelling with moisture, holding his head in her lap. His tongue lapped at her, and his eyes rolled in his head, still watching her. Animals die so much more gracefully than humans. They accept their deaths, while we invest our resources in delaying and sheltering ourselves from this essential fact. The grey resigned himself to nature; we called the vet, and tried in vain to get him up. Dr. Marsh, the veterinarian, scrambled down the hill in his Wellingtons and overcoat. He slowed at the bottom, perhaps sensing the impossibility of the situation. He knelt at the grey’s side. The rider, sobbing, smoothed down the grey’s forelock with shaking fingers. She laid kisses across his eyelids, wrapped her arms around his neck for the last time. The shape of a horse’s neck is perfect for hugging, as though it had evolved that way—it fits snugly with a human chest, like a puzzle piece. I did not watch the grey shudder as life left his body, or the twitching that drew a muffled cry from his rider. He died as beautiful as he would ever be—his white, carefully brushed mane flowing in the creek like silver thread. “I want to go home,” I said to my sister, lip quivering. We walked up the same hill we had charged down before, and trotted our ponies back in silence. We have no need to chase the fox; his henhouse raids no longer have bearing on our wellbeing when the fridge is stocked with chicken salad. The hunt’s purpose, as it has always been, is to legitimize New World culture with an Old World ritual. It is the same reason the American elite build manor houses and host society balls. We are eager to forget that polished boots and bespoke wool coats and thousand-dollar bridles do not make us the lords and ladies that we emulate. We forget that all things—foxes and horses and false aristocrats—must meet with time. But there was a horse who died in the water one day, who could not be saved by new medicines and expensive tears. Offering a reminder of this mortality, there in the leaf-lined hollow.